“I think the Communist conspiracy is merely a branch of a much bigger conspiracy.”—Bella Dodd. Joseph Raymond McCarthy, Senator for Wisconsin, is now remembered mostly as an uncouth bully who recklessly destroyed the lives of decent people in the pursuit of his political career. 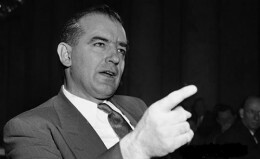 The very term “McCarthyism” refers to a modern-day witch-hunt, and is a label held in as much contempt as the designation “Quisling.” The so-called “McCarthy era” is painted as the blackest period of American history, and anyone who raises a voice against anything of a Left-wing nature continues to be branded as a “McCarthyite” and is himself quickly condemned to disgrace and ruin. Yet recent declassified files have started to show that McCarthy was correct in his supposedly “reckless” and “fraudulent” accusations. This essay is not however primarily concerned with reassessing McCarthy’s accusations as with whether McCarthy was coming too close to other forces which set the course for his destruction. David Aaronovitch thinks the unthinkable about the McCarthy period. The hunt for the so-called ‘Reds under the beds’ during the Cold War is generally regarded as a deeply regrettable blot on U.S history. But the release of classified documents reveals that Joseph McCarthy was right after all about the extent of Soviet infiltration into the highest reaches of the U.S government. Thanks to the public release of top secret FBI decryptions of Soviet communications, as well as the release under the fifty year rule of FBI records and Soviet archives, we now know that the Communist spying McCarthy fought against was extensive, reaching to the highest level of the State department and the White House. We reveal that many of McCarthy’s anticommunist investigations were in fact on target. His fears about the effect Soviet infiltration might be having on US foreign policy, particularly in the Far East were also well founded. The decrypts also reveal that people such as Rosenberg, Alger Hiss and even Robert Oppenheimer were indeed working with the Soviets. We explore why much of this information, available for years to the FBI, was not made public. We also examine how its suppression prevented the prosecution of suspects. Hearing from former FBI, CIA and KGB operatives as well as formerly blacklisted writers, David Aaronovitch, himself from a family of communists tells the untold story of Soviet influence and espionage in the United States. McCarthy began his investigations against Communism when on February 9, 1950, he spoke before a Republican Women’s Club in Wheeling, West Virginia, at which he said that there were at least 57 known Communists in the U.S. State Department, and that the State Department knew it. It has been the common charge that McCarthy launched his anti-communist campaign for no other reason than to serve his own political career by whipping up hysteria. Yet other facts show him to have been a man of principle regardless of his career: In 1949 McCarthy had taken up the cause of German POWs held for allegedly gunning down American prisoners during the so-called Malmédy Massacre. McCarthy exposed the fact that the Germans had had their POW status revoked so that the Geneva Convention did not protect them, and that they were being tortured to extract confessions. Obviously this was not the type of cause that was designed to win friends. This had indeed already brought condemnation to McCarthy by the news media. It was the Senate that insisted that McCarthy make his list of 57 names of subversives public, although he did not himself think it proper, yet it is McCarthy who has since been damned as the man who destroyed the innocent by public inquisitions. McCarthy’s elimination had been guaranteed, not because he was going after Soviet spies and subversives but because he was getting too close to the centres of financial and political power. The deathblow to McCarthy’s campaign was instigated not by some Party hack at the Daily Worker, but by Sen. Ralph Flanders, who introduced the resolution for Senate censure of McCarthy. This was backed by Sen. Herbert Lehman, son of Mayer Lehman, founder of Lehman Brothers international investment bank, of which Herbert became a partner. Having served as Governor of New York State between 1933 and 1942, in 1949, at the age of 71, Lehman was elected United States Senator to fill the unexpired term of Robert F. Wagner, Sr. Re-elected for a full term in 1950, Senator Lehman gave six years of distinguished service to the people of his state and nation. His courage, moral integrity and unfaltering dedication soon made Senator Lehman one of Washington’s most respected senators; just as they had won him affection and honor in New York and on the world scene. He became known as “the conscience of the Senate” as he led those who stood for liberal principles and for the rights of accused individuals in the early 1950s when Senator McCarthy’s influence was at its peak. Utterly fearless and disdainful for his own political fortunes he fought, at times almost alone, against tremendous opposition. Stating that Lehman stood fearless, “at times almost alone,” is nonsense. It was McCarthy who stood fearless and alone, while Lehman had the full weight of the US Administration up to the presidency, the Washington and Wall Street elites, and the most influential of the news media. Columbia University describes the battle between Lehman and McCarthy as “bitter.” “According to Lehman’s biographer, Allen Nevins, on at least one occasion senatorial colleagues feared that the verbal combat between Lehman and McCarthy would lead to blows on the floor of the Senate” (See Allan Nevins, Herbert H. Lehman and His Era, 1963). Lehman, like the Warburgs, Schiffs, et al., was one of those who intermarried among the banking dynasties, marrying Edith Louise Altschul, the daughter of the head of the New York branch of Lazard Frères, the Paris-based banking house. He was awarded the Presidential Medal of Freedom for his campaign against Sen. McCarthy, as was the anti-McCarthy cartoonist Herbert Block. Sen. Flanders as the introducer of the Senate death blow to McCarthy himself had an interesting background, not as some “progressive” or liberal Democrat, but as a Republican, an industrialist and a banker. Under the guise of being an anti-communist, Flanders stated that McCarthy was misdirecting efforts against communism by looking inward, at subversion in the USA, whereas the fight must be directed outward against Soviet expansion. This line fitted entirely with that of the US Establishment: Ever since Stalin foiled the US proposition to create a “new world order” immediately after World War II via the United Nations and the “Baruch Plan” for the internationalisation of atomic energy, both measures which would in the Soviet opinion has assured US global hegemony, the wartime US-Soviet accord had been replaced by a Cold War. The US Establishment sought to recruit influential anti-Soviet Leftists, whom the CIA likes to depict as “anti-communists” (sic). This ideological offensive was undertaken by the CIA, with backing from wealthy and influential elites, in particular the Rockefellers, and primarily under the banner of the Congress for Cultural Freedom, led by pro-Trotsky “Menshevik” intellectual Prof. Sidney Hook, another recipient of the Presidential Medal of Freedom. McCarthy’s most dangerous enemies were, in this writer’s opinion, not the Soviet spies and American Communist Party functionaries he was exposing, but those whom he had not even yet got around to targeting, the power elite and their agents. Flanders had been president of the Boston Federal Reserve Bank for two years prior to being elected Senator for Vermont. In 1942 he was appointed to the Committee for Economic Development, which was established to formulate US post-war economic policy, including the role of the World Bank and the International Monetary Fund. Keep in mind at this stage that both Flanders and Lehman were members of the Council on Foreign Relations, which CFR official historian Peter Grosse described as “the US foreign policy establishment.” Flanders had been involved in a CFR study committee on post-war US foreign policy set up in 1940. Flanders was also a member of the Business Advisory Council, another association of significance that will be considered shortly. Other CFR study group members included Lauchlin Currie and Benjamin V Cohen both from the US State Department, Asia expert Prof. Owen Lattimore, and economist Leo Pasvolsky, special assistant for post-war planning to the US Secretary of State. All of these CFR advisers were to come to the attention of Sen. McCarthy’s investigations into subversion. This CFR connection is a primary key to understanding McCarthy’s political destruction, as will be considered below. Soviet Agents or System Scions? The primary contention of this article is that the individuals and associations that McCarthy was going after were not Soviet agents so much as Establishment scions. Hence when McCarthy attacked US policy in China as favouring the Maoists, it was assumed that the interests being served were those of the USSR. It has more recently been confirmed that McCarthy was correct in pointing the finger at Far Eastern advisers such as Prof. Owen Lattimore and others of the Institute on Pacific Relations. However the policy that was being pursued was on behalf of the American plutocratic cabal, while Stalin did his best to resist a communist takeover and indeed backed Chiang right up until the end of the General’s defeat. The eminent American historian Dr. Carroll Quigley of Georgetown University, acknowledged by President Clinton as his academic mentor, wrote of an international “network” controlled by international bankers, which seeks to establish a system of world political and economic control. Quigley was primarily referring the Council on Foreign Relations and its offshoots, and claimed inside knowledge, having been permitted in the 1960s to examine its papers and records. Although Quigley only writes of this “network” in a scant dozen or so pages in his more than 1300 page magnum opus Tragedy and Hope, which he used as a text for his Georgetown courses, this was sufficient to suddenly bring Quigley’s long and disguised career to an abrupt halt, despite his impeccable credentials and an Establishment liberal-internationalist. It must be recognised that the power that these energetic Left-wingers exercised was NEVER their own power nor communist power but ultimately the power of the international financial coteries, and once the anger and suspicions of the American people were aroused, as they were by 1950, it was a fairly simple matter to get rid of the Red sympathisers. Before this could be done however a congressional committee, followed backward to their sources the threads which led from admitted Communists like Whitaker Chambers, through Alger Hiss, and the Carnegie Endowment to Thomas Lamont and the Morgan Bank, fell into the whole complicated network of tax exempt foundations. One such example of the power of the “international financial coteries,” mistaken as communist influence, was the aforementioned Institute of Pacific Relations (IPR), which was held responsible by a 1951 Subcommittee on Internal Security under Sen. Pat McCarran, for being responsible for pushing China toward communism. Quigley commented on this: “The influence of the communists in IPR is well established, but the patronage of Wall Street is less well known.” He goes on to state that the financial backing for the IPR came from Rockefeller and J. P. Morgan interests, from Standard Oil, ITT, International General Electric, National City Bank, Chase Manhattan Bank, etc. Concerns that seemed more pressing bore down at the turn of the 1950s. The nation was in danger of succumbing to a red-baiting frenzy, marked by the rise into the headlines of Senator Joseph R. McCarthy. Not surprisingly, the Council’s membership seemed solidly united in contempt for the Wisconsin demagogue; under his provocative rhetoric, after all, was a thinly veiled attack on the entire East Coast foreign policy establishment, whose members gathered regularly in the closed conference rooms of the Harold Pratt House. That what McCarthy thought was communism and Soviet infiltration was actually the “entire East Coast foreign policy establishment” centred on the CFR. While a large proportion of the subversives McCarthy was turning the nation’s attention to were CFR members such as Owen Lattimore, Lauchlin Currie, et al., there were three individuals in particular who were too well-connected to the US Establishment for McCarthy to be allowed to continue. He was unwittingly too close to the centre of the US power structure. These individuals were Cord Meyer, John J. McCloy and Robert T. Stevens. Robert T. Stevens was Secretary of the Army at a time when McCarthy was involved in his final campaign before his silencing; an investigation into communist activities in the military. Stevens of J. P. Stevens & Co., Charles E. Wilson of General Motors as Secretary of Defense, and George M. Humphrey of M. A. Hanna Co., as Treasury Secretary; had been elevated to these posts after a meeting between Pres. Eisenhower, international banker Sidney Weinberg, and Gen. Lucius Clay. Those involved were members of the Business Advisory Council (BAC), Weinberg and Clay being on the executive committee. The BAC had been formed in 1933 to advise Pres. Roosevelt on business matters, just as the CFR advised on foreign policy. The BAC was the brainchild of Sidney Weinberg of Goldman, Sachs & Co., who recruited most of the key members. In September 1960 Harper’s Magazine published an expose of the BAC, which it described as “America’s most powerful private club.” The article includes some pertinent insights into the forces that destroyed McCarthy. The Business Advisory Council meets regularly with government officials six times a year. . . . On two of these six occasions . . . the BAC convenes its sessions at plush resorts, and with a half-dozen or more important Washington officials and their wives as its guests, it indulges in a three-day ‘work and play’ meeting. . . . The guest list is always impressive: on occasion, there have been more Cabinet officers at a . . . BAC meeting than were left in the Capital. After the 1952 election, the BAC was having its fall ‘work and play’ meeting at the Cloister, just off the Georgia coast and a short distance from Augusta, where Ike [President Eisenhower] was alternating golf with planning his first-term Cabinet. [Sidney] Weinberg and [General Lucius D.] Clay [members of the BAC executive committee] hustled to Augusta, conferred with Ike [a ‘close, intimate, personal friend’ of both men]. . . . The result was historic: Ike tapped three of the BAC leaders . . . for his Cabinet. They were Charles E. Wilson of General Motors as Defense Secretary; [George M.] Humphrey, then boss of the M. A. Hanna Co., as Treasury Secretary; and Robert T. Stevens of the J. P. Stevens & Co., as Army Secretary. . . . The BAC, powerful in its composition and with an inside track, is thus a special force. An intimation of its influence can be gleaned from its role in the McCarthy case. . . . BAC helped push Senator Joe McCarthy over the brink in 1954, by supplying a bit of backbone to the Eisenhower Administration at the right time. McCarthy’s chief target in the Army-McCarthy hearings was the aforementioned Robert T. Stevens—a big wheel in the BAC who had become Secretary of the Army. The BAC didn’t pay much—if any—attention to Joe McCarthy as a social menace until he started to pick on Bob Stevens. Then, they burned up. During the May 1954 meeting at the Homestead [expensive resort hotel in Hot Springs, Virginia, where the BAC often holds its ‘work and play’ sessions with high government officials and their wives], Stevens flew down from Washington for a weekend reprieve from his televised torture. A special delegation of BAC officials made it a point to journey from the hotel to the mountaintop airport to greet Stevens. He was escorted into the lobby like a conquering hero. Then, publicly, one member of the BAC after another roasted the Eisenhower Administration for its McCarthy-appeasement policy. The BAC’s attitude gave the Administration some courage, and shortly thereafter former Senator Ralph Flanders (a Republican and BAC member) introduced a Senate resolution calling for censure. Between times and often concurrently, he was board chairman of the Ford Foundation, chairman of the powerful Council on Foreign Relations and board chairman of a dozen or so other entities, including the Salk Institute and of E. R. Squibb & Sons. As a lawyer, he represented scores of corporate clients, including 23 oil companies dealing with the Organization of Petroleum Exporting Countries. Senator McCarthy at one point cited a “secret order” McCloy had issued in 1944 as Assistant Secretary of War wherein Communists and their sympathizers were not to be discriminated against by the Army unless a “specific finding” of disloyalty could be made. Bird shows step-by-step how McCloy buttonholed Ike [Pres. Eisenhower] at every opportunity to take decisive action against McCarthy. The occasions for exerting such influence included—but by no means were restricted to—the cozy camaraderie of a “stag party” at the White House. Thus, what was going on behind the scenes was in fact a “strange bedfellow” coalition whereby extremely powerful forces on Wall Street were pushing in the same direction as the Communist Party USA—the goal being the destruction of the Wisconsin senator and the termination of his investigations. The other major figure about to be investigated by McCarthy was Cord Meyer, an omnipresent CIA operative who was responsible for special operations involved with recruiting and using anti-Stalinist Leftists. Meyer for example had recruited to the CIA sponsored, phoney “New Left revolution” LSD guru Timothy Leary and seminal radical feminist Gloria Steinem. In 1948 Timothy Leary, a psychology graduate student, met Cord Meyer at a Milwaukee convention of the Left-wing American Veterans Committee, of which Meyer was a founder. Leary credited Meyer with, “helping me understand my political cultural role more clearly.” In 1950 Meyer was assigned to the CIA’s International Relations Division, which included the Congress for Cultural Freedom, the aim of which was to support, fund and infiltrate Left-wing movements. Meyer was a co-founder, with James P Warburg of the Warburg banking dynasty, of the United World Federalists in 1947, to promote a World State, and he became president of the World Federalists in 1948. In regard to Meyer’s role in the founding of the United Nations Organisation as part of the American Delegation, it is important to note that according to the 1948 Times interview: “There he saw the United Nations born. He deplored the veto, which left U.N. virtually powerless to prevent aggression.” It is highly significant that it was Joseph Stalin who wrecked these globalist plans, by insisting on a veto. McCarthy described the CIA as a “communist sinkhole.” Information had been given to him by the FBI on Leftists in the CIA. The so-called “Communism Fighter,” Cord Meyer, had already been considered a communist by the FBI but was protected by the CIA, which according to Meyer’s own account refused to permit the FBI to interrogate him. In 1953 McCarthy stated he intended exposing a hundred communists in the CIA, and one of the first was to be Cord Meyer. A media smear was launched under the direction of Frank Wisner, the head of the CIA’s Office of Policy Coordination, who marshalled CIA connected journalists Drew Pearson, Joe Alsop, Jack Anderson, Walter Lippmann, and Ed Murrow. Another influential CFR member who was exposed by McCarthy but ultimately called to account by Richard Nixon, was Alger Hiss, who also enjoyed high-level patronage. Helen Lehman Buttenwieser, daughter of Arthur Lehman and niece of Sen. Herbert Lehman, was a lifelong, tireless defender of Hiss, a senior official of the US State Department, and General Secretary at the United Nations Founding Conference, when Hiss was convicted for perjury in 1950. Helen Buttenwieser was married to Benjamin Buttenwieser, a senior partner of Kuhn, Loeb & Co. Her sister Frances married into the Loeb family. As noted, the CIA instigated a smear campaign against McCarthy by calling in their pet journalists. However, the smears against McCarthy had previously been launched, headed up by the Establishment mouthpiece, the CIA-connected Washington Post. Katharine boasts that it was her paper that coined the term “McCarthyism.” While Ms. Graham concedes that the Communist “party had succeeded in establishing a surprising network of infiltrators and even spies,” the Washington Post had already in 1947 started attacking the pre-McCarthy House Committee on Un-American Activities. Graham cites one editorial as “putting the Post’s position succinctly”; stating that the congressional committee was “more dangerously un-American than that of any of the groups or individuals that it had investigated.” What the Establishment feared was not McCarthy’s attacks on Soviet spies and agents, but that an American nationalism would be generated as a by-product. Both Katharine and Philip Graham were members of the CFR. If these attacks have not yet reached a point of grave danger it is because they are mainly conducted by men of small intellectual stature. . . . They are little men who might otherwise be overlooked. They are little men who are intoxicated with a bit of power and splash of publicity. We cannot indefinitely have these arrogant upstarts prying into matters which are no affairs of theirs, including the private opinions of our citizens. As Kamp commented, this was “pure propaganda. It included not a name or fact.” However it is typical of the nonsense that has continued to this day to be heaped upon the memory of McCarthy. In contrast, one of McCarthy’s prime subjects of interest, Prof. Owen Lattimore, was heralded as a hero by The Times, featuring Lattimore’s photo on page one with a glowing review of his book Ordeal by Slander. Kamp states however McCarthy’s own book McCarthyism: The Fight for America was blacklisted by The Times, as were all other books by McCarthy’s publisher, Devin-Adair. The Times was published during this period by Arthur Hays Sulzberger, whose other associations included serving as a trustee of the Rockefeller Foundation (1939-1957), and membership of the CFR. I know the truth of that by my own experiences. I said publicly that Joe McCarthy was one of my three favourite Senators (The other two were William Jenner of Indiana and Robert Taft of Ohio), and so I was regarded in academic circles as one who had intellectual leprosy. I became a tin can for intellectuals to shoot at. I tell this with no bitterness, with no concern for myself, with no complaint; that, in Academe, it was those who supported Senator McCarthy who were ostracized, attacked, and in danger. Meanwhile at my college, as at all colleges I knew (and I knew many) the majority of the faculties spoke openly, and freely, and with venom, of Senator McCarthy. A different perspective on Joe McCarthy: Mrs Jean McCarthy thanks the Marine Corps for the honours that were accorded to her late husband, showing a man of tolerance, bravery and humour. Note Mrs McCarthy’s references to the DCF and the Air Medal Four Stars, and the citation for bravery written by Admiral Nimitz. The letter is featured on the website of The 8th & I Reunion Association of the US Marine Corps. McCarthy, a Judge at the time of World War II, had volunteered for Service, despite his exemption. One of the major smears against McCarthy continues to be that he had not seen active service, that the image of “Tail Gunner Joe” was a myth, and that he had faked the Nimitz citation for bravery. Bella Dodd was a member of the National Committee of the Communist Party USA, leaving the party in 1948. Comment to W. Cleon Skousen, former FBI special agent and Police Chief of Salt Lake City. The Naked Capitalist (Skousen, 1970), p. 1. Ibid. McCarthy was never permitted to make full disclosure of his evidence. That he referred to three separate lists of subversives was distorted by the media and portrayed as inconsistency by McCarthy. Considering Lehman’s New York constituency, he would have gained its esteem regardless . . .
 Ralph E. Flanders, “Activities of Senator McCarthy—The World Crisis,” Congressional Record—Proceedings and Debates of the 83rd Congress, Second Session (Washington, DC: U.S. Government Printing Office), March 9, 1954. Frances Stonor Saunders, The Cultural Cold War: The CIA and the World of Arts and Letters (New York: The New Press, 2000). Ralph E. Flanders, Senator from Vermont (Boston: Little, Brown, 1961), pp. 179-80. Time, National Affairs: “The Dispensable Man,” August 2, 1954. Joseph R McCarthy, America’s Retreat from Victory: The Story of George Catlett Marshall (Boston: Western Islands, 1965), p. 57. Originally published by Devin-Adair, 1951. This book by McCarthy on how China was delivered to Mao via the USA is an example of how McCarthy’s arguments were meticulously documented. Laurence H. Shoup and William Minter, Imperial Brain Trust: The Council on Foreign Relations and the United States Foreign Policy (Lincoln, NE: Authors Choice Press, 1977), pp. 120-21. Jung Chang and Jon Halliday, Mao: The Unknown Story (London: Jonathan Cape, 1970), “Saved by Washington,” pp. 304-11. Carroll Quigley, Tragedy and Hope (New York: the MacMillan Company, 1966), p. 950. Robert Eringer, The Global Manipulators (Bristol: Pentacle Books, 1980), p. 9. Comments by Quigley to Eringer. Quigley, op. cit, p. 954. Dan Smoot, The Invisible Government (Dallas: The Dan Smoot Report, 1964), p. 81. Smoot, a former Harvard professor joined the FBI as a special agent. His book is one of the first exposing the CFR, and is meticulously researched. Hobart Rowan, “America’s Most Powerful Private Club: How a semi-social organization of the very biggest businessmen—discretely shielded from public scrutiny—is ‘advising’ the government on its top policy decisions,” Harper’s Magazine, September 1960, pp. 79-84. “John J. McCloy, Lawyer and Diplomat, Is Dead at 93,” New York Times, March 12, 1989. Frances Stonor Saunders, The Cultural Cold War: the CIA and the World of Arts and Letters (New York, The New Press, 2000). “Opinion in a drawing room,” Time Magazine, February 16, 1948. http://www.time.com/time/magazine/article/0,9171,794188,00.html. “Cord Meyer Jr., Communism Fighter at C.I.A., Dies at 80,” op. cit. K. R. Bolton, Foreign Policy Journal, op. cit. Cord Meyer, Facing Reality: From World Federalism to the CIA, 1980, pp.60–84. Jack Anderson, Confessions of a Muckraker (New York: Random House, 1979), p. 208. Deborah Davis, Katharine the Great (New York: Sheridan Square Press, 1991), p. 131. Katharine Graham, Personal History (New York: Knopf, 1997), p. 193. Jospeh P. Kamp, How the New York Times Betrayed its Readers on “McCarthyism” (New York: Headlines, 1954), p. 2. Times Sunday Review of Books, July 30, 1950, p.1. Kamp, op. cit., p. 5. E. Merrill Root, “Joe McCarthy: Why the ‘Liberals’ Hate Him Still,” American Opinion, Belmont, Mass., March 1973, Vol. XVI, No. 3, p. 86. Fred J. Cook, The Nightmare Decade: The Life and Times of Senator Joe McCarthy (New York: Random House, 1971), p. 537. E. Merril Root, op. cit., p. 93. Source: Ab Aeterno, no. 4, September 2010. Published: November 6, 2013 | This entry was posted in North American New Right and tagged Ab Aeterno, articles, Carroll Quigley, Communism, Joseph McCarthy, Kerry Bolton, McCarthyism, North American New Right, plutocracy, reprints, the Jewish question. Both comments and trackbacks are currently closed. Interesting. But why wasn’t Stanton Evans’ monumental and authoritative “Blacklisted By History” mentioned in the bibliography? This reads like a thriller, straight from The Manchurian Candidate. I myself used to take the McCarthy myth granted for years. It is mind-blowing to see how far from the truth it was. A very great American. There is no one who has been more unjustly slandered. I would be very pleased in the New Right chooses this Man as one of its heroes. Good article. I know that no government or system is perfect, but America’s seems especially bad. Both in McCarthy’s time and today. It seems to be more of a “shadow” government than anything else. Nowadays many ordinary people under 30 or even 40 do not recognize McCarthy’s name or what he stood for. Amazingly, more than a few don’t even know what communism is. I met one young man on a train a few years ago, a supposedly well-educated guy in his mid-20s, and during a conversation with him I mentioned communism and he asked me what that was. I thought he was putting me on. He wasn’t. I have encountered this with a number of others too. That reminded me of Dr. William Pierce’s mention of talking to a journalist who didn’t know who Aesop was when DrP mentioned him. This is the historical blackout, or memory hole, playing out before our eyes. The culture is made to disappear, the heroes are made to fade, vital events are cast into oblivion. I periodically come across old copies of the John Birch Society’s ‘American Opinion’ and similar things from the 1960s or 70s. That group was, and still is, blasted as extremist, nutty-kooky, paranoid, etc., but it is amazing to read through these materials and see how exactly right they interpreted things and predicted future events via the ‘conspiracy’ as they called it. I mean they often got it right in every detail. The only fault I can ascribe to them is that they wouldn’t mention Jewish involvement, unfortunately. McCarthy was right in just about every accusation he made or suspicion he harbored. Indeed, the subversion, the espionage, the treason, et cetera, was far deeper and more successful than he could have imagined.